Profile Films, a manufacturer of industrial plastics, embarked on a journey of powerful change when they ambitiously renovated a 1942 manufacturing plant, relocated their entire facility, and carved out a new brand—all in less than a year. Square One guided the growth of the brand from the creation of the logo to the renovation of the new facility and the identity system and website that introduced the new Profile to the world. In collaboration with Profile’s A+D firm, Via, we created a thoughtfully branded environment, consulting on surface materials, floor plan, furniture, lighting, landscaping, and interior styling. 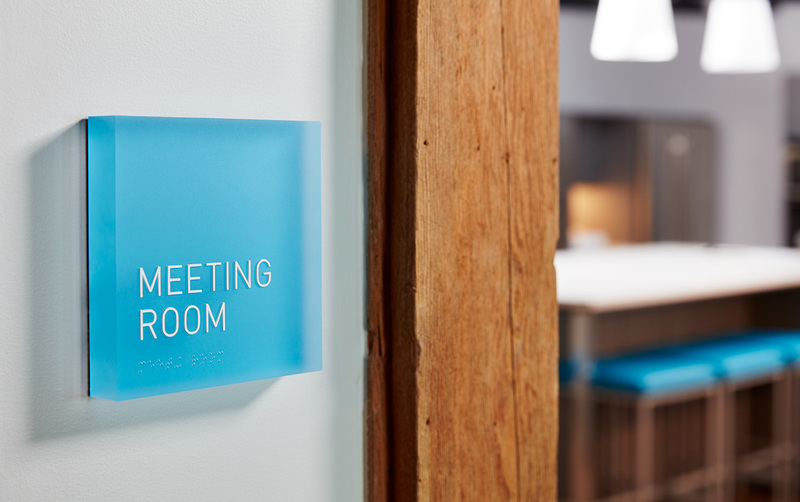 A custom signage system was designed to emulate the translucent, blue-tinted plastics manufactured by Profile and to further unite the facility with the new identity system. The installation of a 9-foot tall sculptural sign at the office entry culminated the official launch of the brand in 2015 and has since become a neighborhood landmark and source of company pride. Profile’s dedication and willingness to invest in their brand continues to energize their team and position them as a leader in their industry.